This French potato salad is not your mom’s potato salad recipe. And we couldn’t be more okay with that. As to the potato salad’s exact provenance, we can’t say, as we refer to it as “French potato salad” because the recipe relies on egg yolk, rather than mayo or sour cream, for its enviably creamy consistency. That’s really rather reminiscent to us of how the French rely on egg yolk to impart a velvety richness to countless things. And, on a separate note, it also sorta reminds us of salade Niçoise, minus the tuna and olives. (Although wouldn’t olives be lovely in this?!) So go on. Try it. And then tell us if you feel we got the name right. As with any recipe that relies on raw eggs, this French potato salad should be avoided by pregnant women, the very young, the elderly, the ill, and those with compromised immune systems. Here’s more useful egg safety information. 2. Bring the water in the saucepan back to a boil. Add the green beans and cook for about 2 minutes, until the beans are bright green and almost tender yet still retain a little crispness. Fill a large bowl halfway with ice water. Using a slotted spoon, scoop the green beans from the boiling water to the ice water and let them chill for a minute or so. Drain the beans and pat them dry. 4. Slice the potatoes about 1/4-inch thick. Cut the beans into 1-inch pieces, first halving them lengthwise if desired. Dump the potatoes, green beans, onion, and dill in a large serving bowl and gently toss. 5. Make a vinaigrette by combining the mustard, garlic, vinegar, and oil in a Mason jar, screwing on the lid, and giving it several hard shakes. (Alternatively, you could just whisk the vinaigrette together in a small bowl.) Season with salt and pepper. 6. Using the back of a fork, crush the soft-boiled eggs against the side of the salad bowl to release the yolk and coarsely chop the white. Gently mix the eggs and some of the vinaigrette into the potato and green bean mixture. Taste and adjust with more salt or vinaigrette as desired. You can serve the potato salad immediately, but it’s arguably best after an hour in the fridge. 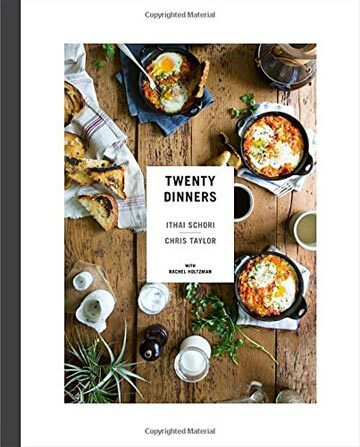 French Potato Salad Recipe © 2015 Ithai Schori & Chris Taylor. Photo © 2015 Nicole Franzen. All rights reserved. All recipes and photos used with permission of the publisher. 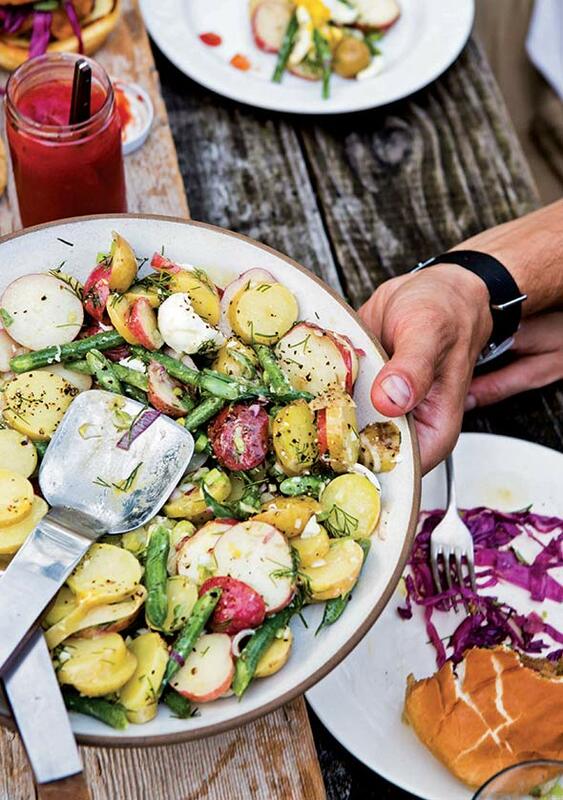 This French potato salad recipe is definitely a winner. I'm really accustomed to the "standard" potato salad at the family barbecue, the after-church function, the too-often home-going services for loved ones. You know the one. It's a mix of too-soft potatoes, lots of Gulden's, and celery and onion staples. This recipe right here takes potato salad to a whole other level. It's something about the vinaigrette dressing that gives it such a nice kick (and makes it even better the next day). I enjoyed the snap of the green beans against the velvety texture of the potatoes. And that's not to mention the dill (I used about 1/4 cup), which brightened the flavors just so and added that little bit of "extra" to bring all the flavors together. And to top it all off, this dish offers bright, fresh colors reminding you of summertime and sunshine. I'm going to push the envelope and bring this to the next party. I'm sure it will be embraced. I was able to find really small baby potatoes, which took just under 20 minutes to become fork-tender. Delish! My love affair with mustard began when I was a toddler. Needless to say, I try every mustard recipe I can get my hands on. And boy oh boy, this French potato salad recipe is brilliant. Soft-boiled eggs, mustard, potatoes—how could you not fall in love? I used an organic baby potato medley which included gold, red, and purple potatoes. The nuttiness of the purple paired exquisitely with the mustard vinaigrette. The onions added extra texture and heat to the entire salad—nice touch! I gently crushed the eggs in the salad with a fork and paired it with a grilled whole lemon chicken. It was an easy yet supremely delicious evening. Best of all, I didn't need to add any extra spice to the salad. It was simply perfect. This French potato salad is a great alternative to a mayonnaise-based potato salad. The title should actually be Potato and Haricot Vert (or Green Bean) Salad with Mustard Vinaigrette, as there seemed to be just as many green beans as potatoes on one’s fork. My 18 small new potatoes weighed a little more than 2 pounds and were ready after 16 minutes simmering. I used haricot verts instead of green beans. I blanched them for 2 minutes before plunging them in an ice bath. My bunch of dill yielded 1/4 cup chopped dill. Initially, I used 7 tablespoons red wine vinegar as well as 7 tablespoons extra-virgin olive oil to make my vinaigrette. After tasting the dressing, I added 1 more tablespoon olive oil. The eggs were too smashed for my liking. I would have preferred larger chunks of hard-boiled egg, so that they were more discernible. I do see myself making this salad again but with hard-boiled eggs chopped into fairly large pieces. This French potato salad could easily feed 8 to 10 people, as long as you had other sides to keep it company. This is a very yummy potato salad with the unique slant of adding soft eggs, rather than mayo or sour cream, to coat the potato and build creaminess. I chose to use yellow new potatoes. The potatoes took about 30 minutes to cook once they came up to a boil. I set the cooked potatoes on a small sheet pan with paper towels and slid them into the fridge to cool while I continued to work. My haricot verts were cooked to crisp and bright green in about 2 minutes. I set them in an ice bath to chill while I moved on to the eggs. Counter to how I normally cook soft eggs, I added these to the potato and green bean water, which was at a rolling boil. I cooked them for 5 minutes in water moving rapidly enough to be boiling but not too excitedly to crack the eggs. While I waited, the dressing came together in a Mason jar thanks to a couple of exuberant shakes to emulsify the ingredients. For the assembly, I added the eggs to the bowl with just the onions, dill, and dressing. I gave them a good crush, chop, and stir to create a thickened dressing that coated the back of my spoon. In went the potatoes and green beans for a final toss. The eggs were not quite soft-cooked at 5 minutes and produced what I would consider a coddled egg for emulsifying. The egg could probably stand to boil for an additional 1 to 1 1/2 minutes. Barbecue season is upon us, and potato salad is my go-to comfort food. The heartiness of potatoes with some crunchy vegetables and a creamy dressing is just so satisfying. But like most comfort foods out there, potato salad is usually extremely heavy and fattening. There are many recipes for potato salad that uses a light vinaigrette instead of a mayonnaise-based dressing, but it loses that richness that you would get from that creamy mayo. That's where this French potato salad recipe differs. The soft-boiled eggs give the salad that creaminess while being a healthy alternative to a traditional potato salad. Having the light mustard vinaigrette allows the crunch of the beans and the dill to shine, while getting a wonderful, tangy, herby, acidic mouthful of food. I absolutely just found my new go-to potato salad recipe. The potatoes cooked for 15 minutes before they reached the doneness I like. I used a fork to mash the soft-boiled eggs into the salad. It was the best option since it broke the yolk perfectly while cutting it up into smaller pieces. While the making of this potato salad recipe didn’t go as smoothly as I'd hoped, we did enjoy it in the end. The dressing was tangy, and the creaminess got an assist from the runny egg yolks. Normally I like conserving pans and water, but cooking the potatoes, beans, and eggs in sequence in one saucepan seemed odd to me. Even though the potatoes and beans were clean, the water looked pretty murky by the time the eggs went into the pan. This system did work, but there wasn’t enough water left in the pan when it came time to add the eggs, so I had to pour in more and wait for it to boil. Fortunately, I had already sliced the potatoes, cut the beans, and put them in a bowl before peeling the eggs. The eggs wouldn't peel properly and broke apart as I was working with them. It was very hard to get the shell bits off the eggs while they were oozing yolk and the white was too runny for my taste. My potatoes were a mix of red, yellow, and purple (or red, white, and blue). The potatoes practically peeled themselves. Several purple potatoes broke apart while I was cutting them. Other colors remained intact, even ones that were a little smaller than the purple ones. Lots of peel started to come off too. I crushed the eggs into the potato salad with a dinner fork and mixed in about half the dressing. My salad looked essentially like the photo, but the potatoes were more smashed. I’m not sure how secure I feel about soft-boiled eggs in a potato salad, especially one that is not going to be eaten all in one sitting. But mixing egg yolks with the mustard vinaigrette effectively made a fresh mayonnaise for the dressing, albeit one that was only partially cooked. Please, don’t worry about what the potatoes soak up from the earth. Organic orshmanic. I never met one person who lived forever or never got sick because they ate organic…but, they sure spent a lot more for food in the long run. Thanks for your reply, Stu. I think consuming organic foods is a personal choice (as is choosing not to eat organic). Both points of view are respected here. Personally, we go for organic as often as we can.